We are camping next week in Rangeley. In a state with an abundance of outdoor venues, Maine makes my head spin. Rangeley, one of the state’s most popular regions, is nestled to the northwest, in the corrugated topography of the Appalachian plateau. I don’t know Rangeley very well, having only passed through a few times. So, in an effort to expand my experience (a discipline I recommend, expanding one’s experience), Rangeley it is. I contacted a campground on Cupsuptic Lake and made arrangements for a site. Unlike many of the western states, Maine does not have vast regions of public land. One can go Ninja camping–find a spot and pitch a tent–but most likely you will be poaching on someone’s property–land owned by a lumber company or a public trust. I Ninja camp occasionally, particularly if I’m just knocking around the woods; but usually I stay in a campground. This campground maintains about three dozen sites on the lake, assembled cheek by jowl, one abutting the next. That’s not my style. Instead, I reserved one of the “remote” sites a few miles to the north. Two of the sites are hike-in only, one site is accessible only via four-wheel vehicle, and two or three can be driven to. I went to the map store at Delorme in Freeport and purchased the topographical Kennebago Quadrangle of the area. (Proudly, I am a map nerd.) 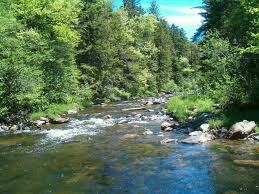 The remote campsites follow the Cupsuptic River north, dotting the water at intervals of about two miles. One site, called Moocher’s Home, looks particularly inviting. It sits at a twist in the river, about a mile before it spills into the lake. I find it curious that the campground’s web page claims that “all remote sites have full cell phone service.” They perceive this to be a selling point. Perhaps it is. But not for me. There is an article in today’s Times called, Turn Off the Phone (And the Tension) that speaks to modifying the thirst for the technological. (Admittedly, a personal challenge both desired and illusory, a classic tension.) I’ve written before (read here, or go to my category “technology”) of my longing for a life less digital and more analogue, a life blend I don’t seem capable of achieving. The article quotes an academic of behavioral science who recommends “setting up a kind of screen diet, building in a period each day to go screenless, either by going for a run and leaving your phone at home, or by stashing it in a drawer during dinner or while hanging out with friends.” This sounds like an addict treating his problem by tucking his stash away in a sock drawer, but I guess one has to start somewhere. Regardless, I am going into the woods untethered–by choice. It will be just a few days. Too, it will provide a warmup for a longer off-line period I’ve scheduled late in October. I’ve blocked off two weeks for what I am calling a “writing retreat.” I’ve rented a cabin Downeast and will go it unplugged, experiencing, if you will, the acoustic version of life. Two weeks is a long time for an addict to go without. It should afford me a clear measure of my problem. My name is Doug and I seek balance.